Congratulations, Nonoy. I’m glad so many people love your anime! Aaron thank you for the support. Congrats! … and thank-YOU – for sharing your creativity with us! Madame many thanks to your encouraging comment. JMRO98 thank you so much. What a great accomplishment! congrats on the followers. Camc1105 thank you so much. Lily my secret followers like you!!! thank you so much. Madame Jenn thank so much. I’m really loving your style. Congratulations on your 500th follower ! That must make me 501 ! ha ah ! And I just received my 100th follower to boot. This community is just starting to show itself to me, and I can’t believe the reception thus far, and i’ve only been blogging for 3 days ! More Power to you, thanks for coming bye. Wonderful! That is quite an accomplishment. Thanks for the “like’ on my blog today. Rutheh thank you for the warm comment. kyzmit thank you so much. I wish I can buy every single followers a cookie. Thank your for the warm comment. Madame you made my day. Thank you. Kelly thank for your kind words. Hey Nonoy Manga, Congrats. 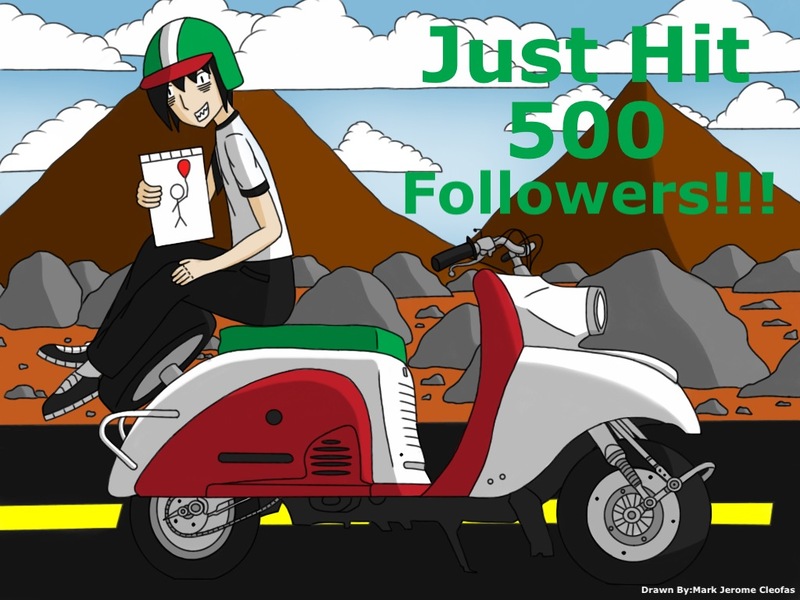 You have a great blog and many more followers to come! That’s a very nice comment thanks you. Well done! I’m about on my 300th follower. How long have you been blogging? thank you so much for the warm comment. Jymiely thank you so much. Congratulations!! Your drawings and stories are wonderful! i’m glad you like my blog site, thank you. Wow Nonoy Congrats you are are one great talented kid! Madame Jenny i will treasure you continues support. Kristin you made my day. Madame thank you so much. Mskraizy i appreciate your warm comment. thank you. That’s an awesome comment than you so much. Hay thank you so much. I love your pet photography and landscape excellent work. Elizabeth thank you so much.. I am not surprised by this. For someone who is blessed with the talent, wit, and a good heart, you will always have the world as your audience. I am sure tons, and tons of good things coming your way. More power, Noy! And God bless always! Aina thank you so much for your kind words. Congrats! That scooter is super rad! Hello I nominated you for the “One Lovely Blog Award” award. Kawashimade you make me and my mother very happy. thank you some much. Congrats! Love your art and stories! Congratulations, Nonoy Manga! I can’t say I am surprised though. Your work is excellent. And fun! Your comment is very much appreciated thank you. Congrats! I’m so happy for you, and not really surprised:) You’ve got amazing artwork. Love your blog! Dana your comment means a lot to me. thank you. The nomination lighten my heart, I will treasure that more than the Bloggers award. Thank you so much. You’re welcome ! You really deserve it. Hi, Noy, I nominated you for the very inspiring blogger award. You deserve it! Cat that sounds great thank you. By the way, there’s an email on its way to you belatedly replying to your contact form one to me. I still find it amazing that anyone follows me! :) Congrats my friend. Hi hillbilly I love the politics in your blog site. It keeps me updated on what’s going in the US. thank you for your kind comment. Frizz thank you so much. Jean your comment means a lot to me thank you. Naima thank you so much. Blazing thank you so much. That’s so impressive! Great work, by the way! Sciencelens thank you so much. You derseve it with all your hard work. Nice drawing to celebrate with. Congrats thats a real achievement! Zen and Genki I’m glad you like it. Thank you. Congrats, hope to follow you ! You have a great site/blog. I don’t comment that often, but you are really, really talented. Cory many thanks for your kind words.